Royal Caribbean has introduced a new way for guests to capture those cruise memories with the launch of SoundSeeker. The cruise line is going one step or even two steps further from just a regular photo, how about a shareable soundtrack with a video to match? Let’s find out more about this new tool for Royal Caribbean cruisers. 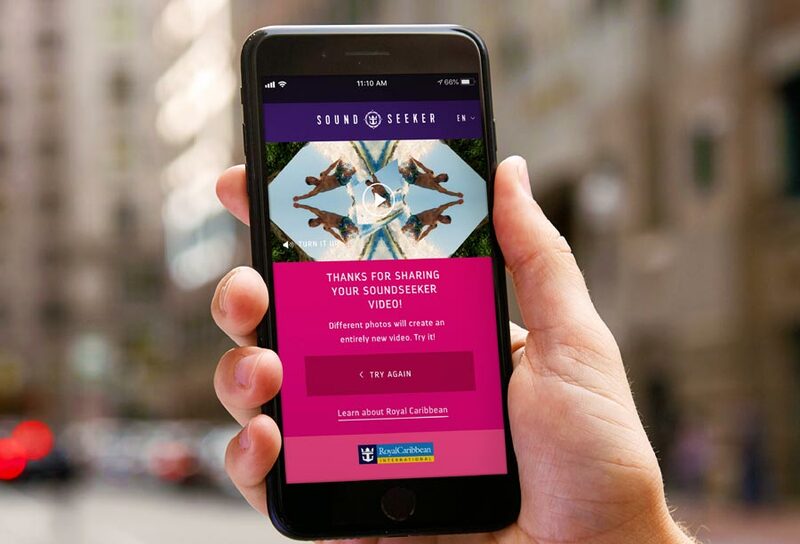 It’s time to forget about that photo memory which will be long forgotten after the cruise, it’s time to move forward with SoundSeeker, a new tool launched by Royal Caribbean which is groundbreaking artificially intelligent (A.I.) driven tech. SoundSeeker can be used by visiting the site and uploading three photos then the A.I. takes over to work the magic! The photos are analyzed based on color, landscape, backdrop, emotion, body language and facial expression. This new patent pending tool will also add unique music and make it sharable. We’re not going to get into all the technical aspects in how this innovative new tool has been made. In brief, Royal Caribbean teamed up with experts from the Berklee College of Music along with technologists to put together a unique song generator to go along with the photos. The AI in SoundSeeker uses Google Cloud Vision to identify certain elements of the photos. The tool also uses machine learning and for this, the team reviewed hundreds of music tracks along with 10,000 photos, matching each of the 2.5 million combinations to one of 10 moods. Royal Caribbean International is leading the way in innovation and constantly bringing new ways to enhance the cruise vacation experience. Even this year the cruise line has brought the innovative SkyPad to the fleet and was the first ever cruise line to feature robotic bartenders. At Cruise Hive we’re looking forward to knowing what will come next!